The Dry Tortugas National Park is a great place to go with kids that allows them to explore, learn about nature, and history all at the same time! There are many things to do on the island and in the water. You can snorkel the majestic and colorful reefs off the shores of the island, observe the park’s unique birds and wildlife, explore Fort Jefferson and the moat surrounding it, and much more. 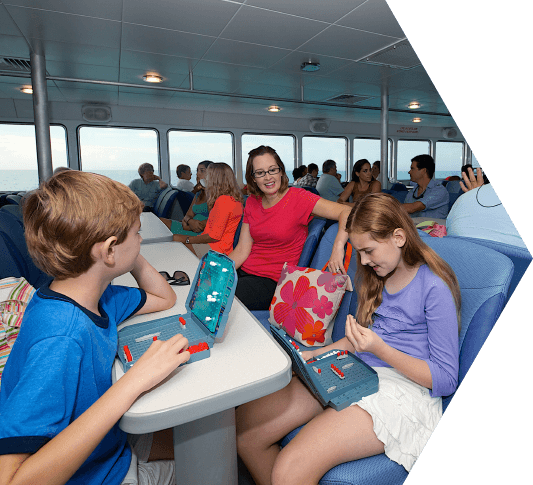 Your adventure begins as you cruise to Fort Jefferson Dry Tortugas National Park aboard the Yankee Freedom III, the fastest, largest, and newest high-speed Ferry in Key West. The boat’s galley serves snacks and soft drinks, and also sells souvenirs. As you enjoy the ride, keep an eye out for turtles and dolphins while you listen to one of our naturalists tell fun and fact filled legends of Fort Jefferson. You may even hear a tale or two about the pirates that sailed the very waters you will be sailing on your way to the Dry Tortugas…Arggh!! The Dry Tortugas also participates in the National Park’s Junior Ranger Program, where you can interactively learn about wildlife, history, and nature at the park. To be a part of the Junior Ranger Program, just pick up your Junior Ranger Handbook at the visitor center, or download it here. In order to receive your Dry Tortugas Junior Ranger badge, you will have to pledge to help keep the Tortugas safe while you visit, and complete all the activities in your handbook. Once you finish all the activities, all you have to do is take your handbook back to the visitor center and they will give you your very own Junior Ranger badge. If you have ever wondered where the name “Dry Tortugas” came from, you’ve come to the right place! When Spanish explorer Ponce de Leon discovered the island in 1513 he was amazed by the amount of sea turtles he saw; they were everywhere! He decided to name the island after the magnificent animals and gave the island the name “Las Tortugas” which is Spanish for “the turtles.” Despite its beauty and abundance of nature, fresh water was scarce on the island, and the word “dry” was added to the name to warn sailors and visitors that they needed to bring their own fresh water to drink. But don’t worry, the Yankee Freedom III will provide you with plenty of food, water and other beverages on your day trip to the Dry Tortugas! Fort Jefferson is the third largest coastal defensive fort constructed by the United States – ever. Fort Jefferson is made up of over 16 million bricks. Construction of Fort Jefferson lasted over 30 years, and it was never officially finished. In 1875 all work on Fort Jefferson stopped, the people left, and the fort was officially abandoned. Fort Jefferson never saw action in a battle or military engagement. Fort Jefferson’s walls are 45 feet tall and 8 feet thick. Largest masonry structure in the western hemisphere. Both red and yellow bricks make up Fort Jefferson. The yellow bricks were placed before the civil war and were from Pensacola, Florida. The red bricks were shipped to the island from Maine during the civil war. The soldiers’ barracks at Fort Jefferson were designed to house 1,000 men, and were more than a football field in length. A fire destroyed the barracks in 1912. The Fort was designed for 420 heavy guns on Fort Jefferson, and they were some of the largest and most advanced weapons of their age. Fort Jefferson was designed to store gunpowder in 36 different magazines, all spread out throughout the Fort to make the powder more accessible although only 32 were completed. J.N.O. Nolan, a master bricklayer who helped build Fort Jefferson, etched his name in several places throughout the fort. Keep an eye out for his carvings! The entire park is about 100 square miles and mostly underwater, but Fort Jefferson located on Garden Key has plenty of space for fun and exploration. In the waters surrounding Garden Key you will find a vibrant intact coral reef system, tons of colorful tropical fish, many species of birds, and of course Loggerhead and Green Sea Turtles! On land you will be able to explore Fort Jefferson with one of Yankee Freedom’s naturalists, and learn about its history before, during, and after the civil war. Fort Jefferson was built in 1846 and two historic lighthouses, which you can also visit, guard its reefs. The Dry Tortugas is also home to over 200 shipwrecks, so if you happen to discover a washed-up artifact, don’t touch it and remember to tell a park ranger. Your discovery may make it to your local museum!